CANNING came into this game desperate for the points and their first win of the season as they entertained joint fourth- placed South West Phoenix at Burrendah Reserve, Willetton. The game started in lively fashion, as neither team could gain control but the action was end to end. Canning’s compact defence restricted the Bunbury-based side to long balls in the early exchanges and at the other end Canning looked threatening on the break. The hosts created a couple of chances in quick succession on the quarter-hour mark, with skipper Callum Roberts shooting over and Laurence Cheyne’s cross/ shot forcing the Phoenix keeper to tip the ball over the crossbar. Shortly after, Canning found the breakthrough that their pressure deserved when Cheyne burst down the left and delivered a cross that Roberts calmly slotted home. The opening goal seemed to be the wake-up call the visitors needed as they started to dominate possession without troubling the Canning goal. With Canning on the back foot, the home keeper Luke Stonebridge was kept on his toes when he saved low to his left to prevent the equaliser. It was a sign of things to come and Canning couldn’t prevent a leveller before the break when a mix-up between Stonebridge and defender Joe Corriea allowed Phoenix striker Carlo Chielini to round the keeper and side-foot the ball into an empty net. The second half started out with both sides seemingly looking to not concede rather than find a goal to put them in front. It was Canning that looked the most likely to take the lead, as they were causing headaches for the Phoenix defence, with substitutes Joe Kelly and Nathan Hubbard getting forward with intent. The pressure finally proved too much and on 72 minutes Roberts beat his man down the right and squared the ball to Hubbard, who finished truly. 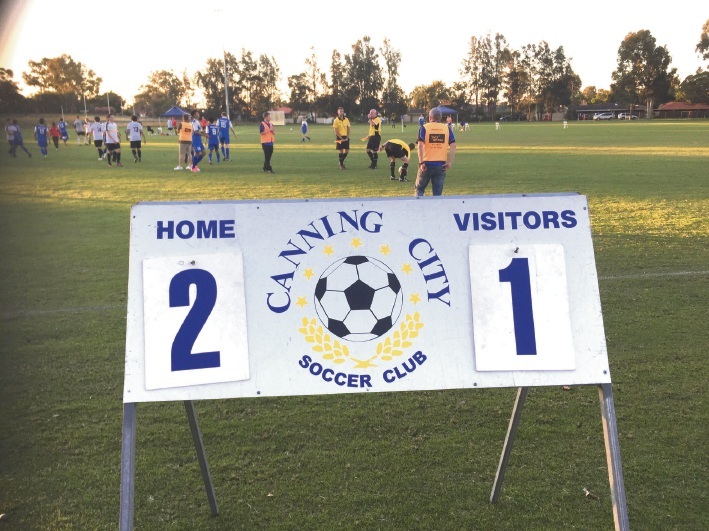 South West Phoenix could not find a way to level the scores and as the final whistle blew the large home crowd were in great spirits as Canning picked up their first three points of the season.